I haven't been making miniatures lately. There have been other things on my to-do list. Like repairing garden statues. This 3 foot tall Jack Rabbit lost the tip of his ear. 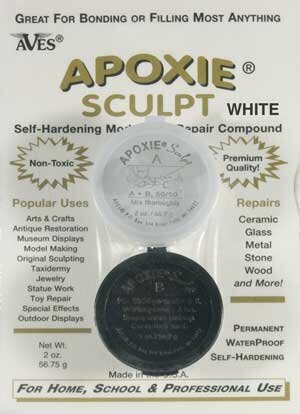 When I found Apoxie Sculpt at the model train shop yesterday, I knew it was the right product to do the repair with. It can be used for so many things. It doesn't shrink and freezing temperatures will not effect it. it cures as hard as stone in 24 hours. After that I can faux paint the tip of his ear to look as grungy as the rest of it. Apoxie Sculpt is a two part (putty like) compound that you mix in equal parts. You have roughly three hours of working time. The list of things you can do with it is impressive. I have no doubt there will be a miniature use for it. It will be one of those projects that pops up and you will just know that it is exactly what you need. Keep a bowl of water close by and some paper towels. Once the sculpting has been done it can be smoothed with water and also textured. Just wash your hands with soap and water.